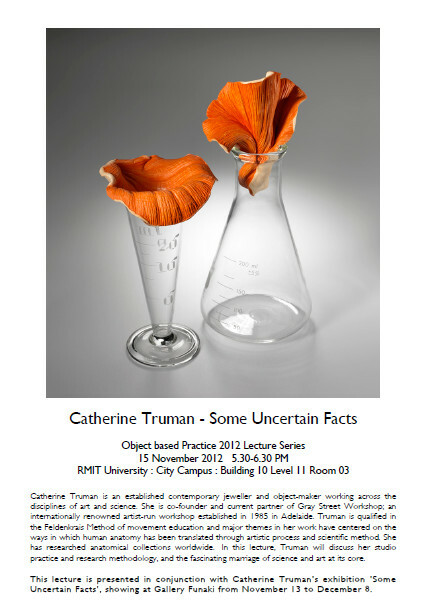 Catherine Truman, co-founder of Adelaide's Gray Street Workshop, is exhibiting a new solo show entitled Some Uncertain Facts, at Gallery Funaki from 13 November - 8 December. In conjunction with the exhibition, RMIT's department of Object Based Practice is hosting a free public lecture by Catherine Truman Thursday 15 November from 5:30 - 6:30pm. The lecture will be held at RMIT (City Campus), Building 10, Level 11, Room 3. A quick heads up: Thursday the 15th is also the opening night of NMIT's gold and silversmithing graduate show, starting at 6pm. Make a night of it and come to both!